Birthplace : Brownsburg, Indiana, U.S.
Gordon Hayward is an American basketball player who plays for the Utah Jazz. He played at Butler University in Indianapolis for two seasons before leaving for the NBA. Hayward emerged as a superstar in his sophomore (second) year, leading his team to a runner-up finish in the 2010 NCAA Tournament. He was selected by the Utah Jazz with the ninth overall pick in the 2010 NBA Draft. Was the ninth overall selection in the 2010 NBA Draft . . . Led Butler to its first NCAA Final Four and the 2010 National Championship Game . . . Selected for the 2010 Final Four All-Tournament Team . . . Selected as Most Outstanding Player of the West Regional and named a finalist for the Naismith Trophy . . . As a college freshman, named to the Foxsports.com National All-Freshman Team. Native of Brownsburg, Ind. ... Full name is Gordon Daniel Hayward ... Son of Gordon and Jody Hayward ... Both his parents stand 5-foot-10 ... Twin sister, Heather, is a member of Butler women's tennis team ... Finished second on the 2009 gold medal-winning U.S. U19 World Championship Team in rebounding (5.7) and third in scoring (10.0) ... Named to the Best of the Best Team at the U19 World Championship in New Zealand ... Named first team All-State and led Brownsburg to the Indiana Class 4A state championship ... In the 4A state title game, hit the game-winning layup at the buzzer to defeat Marion High School, 40-39 ... Received the Arthur L Trester Award, presendted to the outstanding high school senior participant in each classification, based on excellence in mental attitude, scholarship, leadership and athletic ability in Indiana ... Was also a high school tennis player who advanced to the Indiana state singles quarterfinals ... Chose Butler because it was close to home ... His advice to kids is "Dream Big!" ... Was majoring in computer engineering at Butler and maintained a 3.31 GPA (selected Third Team Academic All-American). 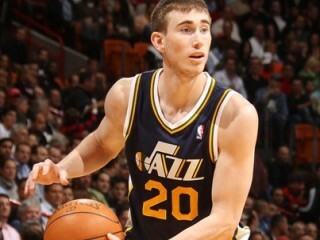 View the full website biography of Gordon Hayward.